General Italian is my most popular and comprehensive skype Italian course. It is available at all levels and is based on vocabulary, grammar and pronunciation activities. These lessons are tailor made and designed to meet your personal wishes and objectives. 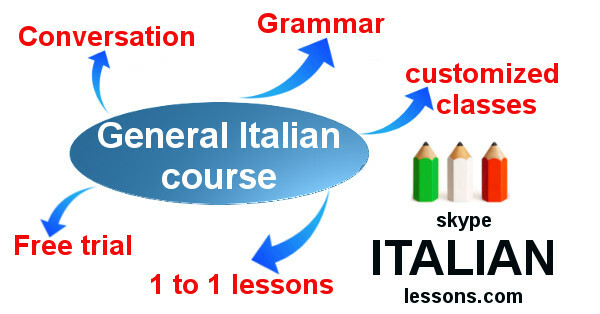 General Italian lessons provide a strong foundation for everyday Italian communication. These lessons are created to build your vocabulary from day one, discussing different and interesting topics and helping to fix mistakes in your pronunciation and grammar. During our Italian language lessons we’ll work to develop all the “four skills”: speaking, listening, reading and writing. General Italian lessons will focus also on conversations. We’ll practice together speaking based on everyday situations which will boost your confidence, vocabulary and fluency in English. During our skype Italian classes we can put together an individual language and cultural training programme. We can talk about the issues that matter with up to date discussion regarding current affairs around the world or in Italy. A great way to keep up to date with your vocabulary and discuss real life situations with a native speaker. The course can be from one week to several months. We can plan one or more skype Italian lessons per week. All learning materials are provided free of charge, I provide all the teaching materials, there are no extra charges. This is just an example of the variety of topics provided in my General Italian course. All my lessons are private (1-to-1) and personalized for each student, so please contact me to discuss your unique requirements. Contact me today to discover how Skype Italian Lessons can help you improve your language skills. Still not sure about this Italian course? Take a free trial lesson to find out more. My name is Marco and I’m an online Italian teacher from Italy. I have been giving high quality online Italian lessons using Skype for years. My online Italian lessons have helped learners from all over the world to become better language users. Originally I graduated in Social and Economic Sciences, I worked as an employee in logistics and communications companies. Later I discovered my true calling as an Italian language teacher. I started collaborating with some associations providing language classes to foreigner living in Italy. My interest in teaching Italian as a Second Language increased and I decided to become a professional teacher. "In 2014 I began Skype classes in Italian with Marco to help me become more fluent in readiness for a trip to Italy. I had already completed Italian 101, and 102, basic levels, at the local community college, and studied hard at home with CDs, films, and grammar books – but languages are living things and I knew what was missing was real, regular conversation with an actual Italian..."
"Marco is an exceptional teacher who has helped me immensely to become more comfortable in Italian; he's also generous with his time and very, very patient -- two important traits in any teacher. I would recommend him highly. " "My company have recently started to work with Italian suppliers. I used to speak a little bit of Italian but my level was not enough for business purposes. I searched several websites, but only Skype Italian Lessons gave me what I was looking for: high quality business oriented lessons; flexible class times with invoices." How my online Italian classes work?